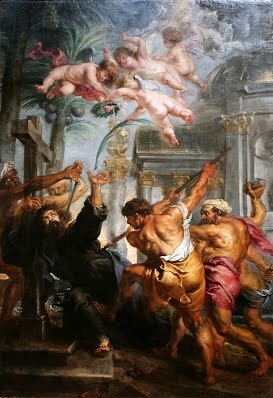 July 3 - Saint Thomas the Apostle - Feast - My Catholic Life! All unbelievers have faith. They firmly believe in God’s non-existence, in the mythical quality of supernatural realities, and in the weakness, not wisdom, of trusting in a reality greater than oneself. Atheism is a belief system, though its object of faith is obviously not God but instead various other sacrosanct, secular “doctrines.” Yet every unbeliever, just like every believer, is tempted by doubt. The unbeliever, whether gazing at a friend’s coffin, dumbstruck by beauty, in a time of crisis, or just lying in the dark of night, wonders if he has everything figured out. Although he shows a brave front, he secretly doubts. He is not certain. He is threatened. There is always the great “perhaps.” Perhaps, just perhaps…the believer is…right. The atheist is under constant assault from faith, primarily from inside himself. Only when trying to quit religion does he realize, painfully, that the drama of being a man cannot be avoided. He exchanges the uncertainty of belief for the uncertainty of unbelief. Today’s saint, known as “Doubting Thomas,”is Christianity’s icon of doubt. He loves, serves, and follows the Lord. Upon hearing of the death of Lazarus, Christ decides to go to Judea, where He has previously come under attack. The Apostles are concerned for Christ’s safety, but Thomas supports Him, saying, “Let us also go, that we may die with him” (Jn 11:16). Thomas is strong and generous. But he is also a man, so he does what men do—he doubts. Christ’s crucifixion was a searing experience for His Apostles. And Thomas doubts that one so cruelly and publicly murdered could be alive. He is told by his co-Apostles that the Lord is risen and has come to them. Still Thomas doubts. He will only believe if he can place his hands in Christ’s very wounds. To satisfy his skepticism, Thomas joins the others and waits on the Sunday after Easter. The risen Lord appears again in the same place. “Peace be with you,” He says to all. And then to Thomas himself: “Put your finger here and see my hands…Do not doubt but believe.” “My Lord and my God!” is all the flabbergasted Thomas can muster in response (Jn 20:24-29). Doubt is often the starting point, the context, and the invitation to faith for Saint Thomas and so many others. Thomas’ simple declaration of faith, repeated by so many throughout history at the consecration of the Body of Christ at Mass, began with doubt. But it did not end with doubt. True doubt leads to a true search. And a true search is always open to its own conclusion, always open to finding. Saint Thomas’ doubt, his moment of weakness, served its higher purpose by anchoring the faith of untold millions who came long after him. The Son of God said “…the kingdom of heaven is like a merchant in search of fine pearls…” (Mt 13:45) and “The kingdom of God is as if someone would scatter seed on the ground, …. and the seed would sprout and grow, he does not know how” (Mk 4:26-27). The kingdom is not the fine pearl. It is the merchant in search of them. The kingdom is not the seed. It is the man scattering the seed. The search, the scattering, the effort, the struggle, the journey. These are the first stages of finding God. Honest, authentic inquiry is god-like. After all, every legitimate search presupposes there is something, or someone, to find. Doubt is the plow that opens the pathway to belief in God. Saint Thomas the Apostle is our guide and patron in understanding how doubt sparks faith. Hearing, he doubted. Doubting, he came. Coming, he touched. Touching, he believed. And believing, he served. Saint Thomas, help all who struggle with belief in God. Through your example and intercession, assist all those overwhelmed by distractions and doubts to come to a well informed trust in the Father and Lord of all.